This delicious sandwich was served by Mary Sue Milliken and Susan Feniger during the 1980s at their Los Angeles restaurant City Cafe. 1. Put 1 tbsp. of the lemon juice, cracked black pepper, and salt to taste into a bowl; stir well. While whisking constantly, drizzle in olive oil to form a dressing; set aside. 2. Put goat cheese, remaining 2 tbsp. of lemon juice, finely ground black pepper, the flesh from the avocados, and a few dashes of Tabasco into a bowl. Lightly mash with a fork; season with salt to taste. 3. Divide avocado mixture between the 12 baguette halves and spread to cover each. Transfer baguettes to baking sheet and broil until just warmed through, 1–2 minutes. 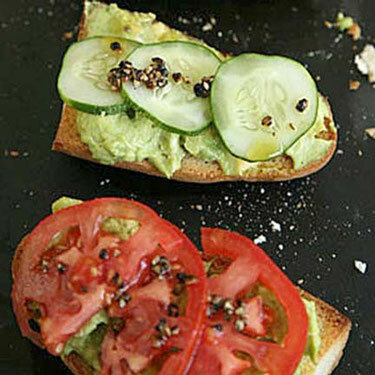 Top the baguette halves with tomato and cucumber slices, in any arrangement you wish. Drizzle some of the cracked pepper dressing onto each. Serve immediately.